May 2016 be a good year for you whatever the circumstances may be! May there be peace in 2016! Refugee Crisis It is certain that none of us will ever forget the coverage of streams of refugees making their ways from South to North, East to West, and I imagine there may be refugees in most European countries at this point. Many along the way have lost their lives,including children. Vienna Westbahnhof Can you imagine what the survivors may have been through? I can not, but I know as holistic practitioner I can help a bit to empower them on their journey. Selfie Time! Pituitary Reflex anyone? It takes a village to raise a child, and it takes many of us to ease a humanitarian crisis May I kindly ask you to consider relief work and/or sharing this with your network of practitioners to encourage others to work with refugees and volunteers to empower and strengthen them and equip them with non-invasive and user-friendly techniques to de-stress. One of Our Many Christmas Presents "Dear Birgit! Thank you so much for all you have done for the refugees and me. (My back feels so good :-). I'll try my best to be there tomorrow to say hi. All the best, Anna Wilhem (volunteer-turned Employee). Teach Self Care to empower refugees on their journey; keeping it simple works well.. taking the pretzel out of yoga if you will and putting the practice on the chair (that is the magic of LVCY). Picking up a few words of Arabic, Farsi is a great ice breaker. Wendy was particularly great at that...but any efforts will be appreciated. - Want to start right now? Goodbye is khoda hafez in Farsi! Shukran is thank you in Arabic. (Wendy and I received the most extensive Farsi lesson from Shiva whom we met three days after she arrived in Vienna. Needless to say we met many wonderful people from Syria, Iraq, Afghanistan, Iran, and other countries as well as many fellow volunteers. Identify those in the group who will be the interpreters (you may need Farsi and Arabic), or ask around in your community and bring your own interpreters. Remember to take care or yourself, bring water, snacks, dress in layers so you can be one hundred percent present. Again, please, help those in need by sharing this with reflexologists, acupuncturists, LVCY and other yoga teachers, other holistic practitioners in your network. On the right after our very first workshop (for about 25) on Christmas Eve with refugees for refugees. Wendy in red next to Birgit, Obaida, one of our interpreters extraordinaire in blue. Remember the Arabic word for Thank you from above? In Farsi it's mamnoon. So as always thank you for listening and sharing. 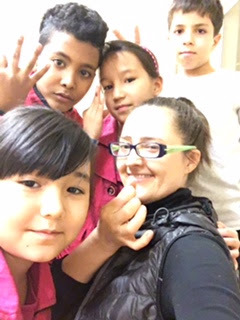 Please support the Vienna Refugee Project (empowering refugee kids, men, women, and volunteers with sustainable holistic self care).